Everyone has their phobias. One of mine is traveling over a bridge, presumably even over non-troubled waters. 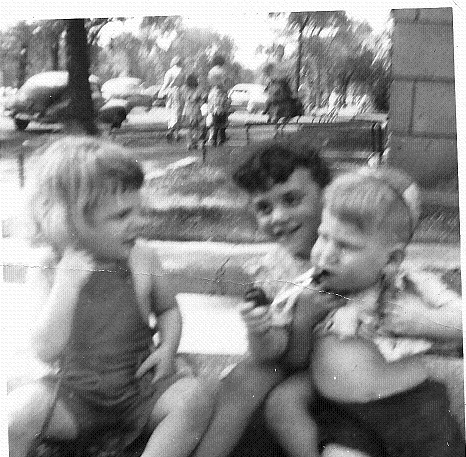 It all started when I was a little kid in the late 1950’s. We lived on Chicago’s Far West Side a few blocks from the newly constructed Congress Highway (years later it would be renamed the Eisenhower Expressway). On Sunday family outings, Dad would take the Congress (until today I still call it this) east towards the Loop, the downtown area. The end of the highway was signified by the gigantic US Post Office built smack dab on top of it. I understand that they built it with the cutout for the normal height of semi-trailer truck traffic in mind. After you went under the building tunnel, you were immediately hit with crossing over the Chicago River. At that spot, the river was no more than fifty or so feet wide. For a kid it was terrifying going over the steel waffle-like bridge pavement rather than solid cement. I was convinced that the ground beneath us was not sturdy and that we would eventually fall into the river. An interesting statistical comparison was broadcast on the news the other day that in 1960, two-thirds of all people before the age of thirty were already in holy matrimony. In 2008, a similar survey was taken and the rate had gone down to twenty-six percent. That meant one of two things: either the latest version of the younger generation was not interested in getting hitched anymore or they were waiting longer before taking the plunge. You’ve heard the expression, “boy, this guy’s in a class by himself!” In my case, it was almost true but not because I had a swelled head. It had to do with taking a course at Northeastern Illinois University on a campus of a couple thousand students where only three other dedicated underclassmen had the same crazy obscure interest. Last week the Internet caught my attention with two stories that are not linked other than the subject of death. In one, a fifty-one year old woman died at her office desk and no one noticed until the next day when they saw her slumped over in her chair. The second story involved a man who has been sitting on ice for the past ten months in a county morgue because no one has come to claim the body. In high school while taking a music appreciation class the teacher told us that the acuity of our hearing would peak in the not too distant future and that it would all be downhill from then on. A teenager doesn’t believe anything an adult tells him so I shrugged it off. In the late 1970’s and early 1980’s I used to go to social outings where very loud music was played while people jerked their bodies around on a dance floor. At the time, the music was much too loud and I knew it was damaging my hearing but I thought it was wise to hang out and catch some action, if you know what I mean. Author Larry TerenPosted on February 23, 2011 Categories Chicago Bulls, Hearing Problems, Talking on the PhoneTags chicago bulls, humor, phone conversation with mother, reduced hearing as you get olderLeave a comment on Hear, Hear! There are no do overs in life. Whatever happens, happens, unless- that is- you are in the movie-making business. A producer with cash burning in his pocket decides that he can re-create a film made a generation or two earlier and do a better job of it. Or maybe he is out of fresh ideas so he takes what has worked in the past and runs with it. That works great for automobiles, trains and planes as well as computers, televisions and phones. But, give me a break! Recently a big deal has been made about a redo of the 1969 John Wayne Academy Award winning movie, True Grit. To me, anything made in 1969 is not yet quite so ancient that it needs to have it redone to suit modern audiences. Besides, I’ve yet to see a re-make that is better than the original, and that includes Ocean’s Eleven and The Nutty Professor. I don’t watch a lot of prime time television- I’m no elitist. I have my peculiar tastes just as everyone does. I can just as readily be entertained by the Internet. But, what I like to do is turn on the tv with the remote control provided by my local cable company and click the menu guide. It displays to the screen a time calendar in grid form of all shows by channel with a brief synopsis of each. I go up and down the roster stopping to read the few description capsules that interest me. One that usually catches my eye is TV Land. The station shows mostly old sitcoms from the 1950’s through the end of the last century. It has recently started airing brand new, first-run shows starring actors and actresses from many of the shows of the older vintage. One of the shows listed was headlined by Betty White. The lady is eighty-nine and still cooking. In the brief write-up the menu guide indicated that Mary Tyler Moore would be guesting with her.